According to data released from the Agency Express Property Activity Index, the UK’s residential property market bounced back in October, and Milton Keynes is leading the way. More than half of the twenty two individual cities monitored on the Property Activity Index experienced increases in month on month house sales in October, with Milton Keynes topping the city ‘hot-spots’ with an increase of +39.3%, followed by Bristol up +35.8%, Southampton up +30.0% and Cardiff up +27.8%. Regionally, East Anglia topped the table for new ‘For Sale’ listings, up +6.9%, the South West was up +5.8% and the South East, up +5.5%. At the other end of the regional ‘not-so-hot-spots’ table for new ‘For Sale’ listings were the North East, down -11.5%, Scotland was down -7.7% and the West Midlands, down -3.4%. 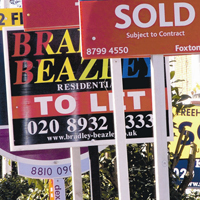 “In recent weeks the UK property market has been drowning in negative publicity and market speculation. Our October Index is evidence that the current ingredients of low interest rates and the low supply of well presented, realistically priced properties, can be a real recipe for success.